ReBirth for iPhone: first it was reborn, now it's being retired. Propellerhead Software has announced that ReBirth for iPhone will be "retired" from the App Store on 1 June. In a post on the Propellerhead forum, Kalle Paulsson, the company's Product Manager for Apps, revealed that the decision has been taken in order to "better focus our mobile music making offering". "If you want ReBirth for iPhone for your collection of Propellerhead apps, you have until June 1st to purchase it," explained Paulsson. "After that, you'll be able to use it as it is, but we won't be supporting it and you won't be able to upload your songs. You also won't be able to download it again if you delete it from your device and your iTunes apps folder." 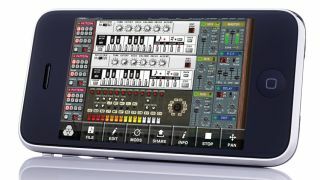 ReBirth, which emulates Roland's TB-303 Bassline synth and TR-808/909 drum machines, began life as a desktop application in the late '90s and was reborn on the iPhone in 2010. Interestingly, it appears that the iPad version of ReBirth will continue to be available. So, does this mean that ReBirth for iPhone is making way for a new app or that Propellerhead simply wants to focus on developing Figure, its flagship mobile music making offering? We shall see.